CGIAR’s Tracking Improved Varieties in South Asia (TRIVSA) project was implemented during 2010–2013 and focused on the rainfed areas of South Asia. Complementing CGIAR’s DIIVA project, TRIVSA assessed the effectiveness of varietal improvement programs focusing on the region’s important food crops, including humid and sub-humid varieties of rice, and semi-arid varieties of sorghum, pigeon peas, pearl millet, groundnuts, and chickpeas. The International Rice Research Institute (IRRI) led the project and implemented the rice component, and the International Crop Research Institute for the Semi-Arid Tropics (ICRISAT) implemented work on the other crops. The project was implemented in collaboration with the national programs of Bangladesh, Bhutan, India, Nepal, and Sri Lanka. 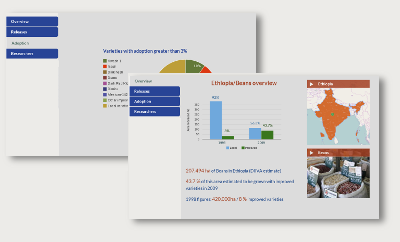 The project’s main objectives were (1) developing estimates of recent scientific capacity of crop improvement programs in the national systems, (2) assessing varietal outputs, and (3) estimating cultivar-specific adoption of improved varieties. The data uploaded here pertains to the five dryland crops. 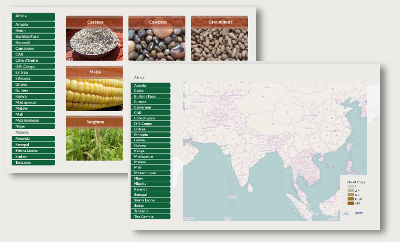 The datasets for rice will be uploaded in early 2015. As we launch the site, we are reviewing the primary data files and website graphs again, and there may be minor changes in the database. These changes will be listed (with dates on which they were made) for researcher convenience. For further information, please contact Lakshmi Krishnan at the CGIAR Independent Science & Partnership Council (ISPC) Secretariat, Kumara Charyulu at ICRISAT, or Ma. Lourdes Velasco at IRRI. Note: As we launch the site, we are reviewing the primary data files and website graphs again, and there may be minor changes in the database. These changes will be listed (with dates on which they were made) for researcher convenience. Please check the website in February 2014 for updates.